Celebrate Jewish traditions with this fun, reusable sticker book! Covering all aspects of the Jewish festival of lights, from the lighting of the Hanukkah menorah, to the delicious foods eaten during this holiday. 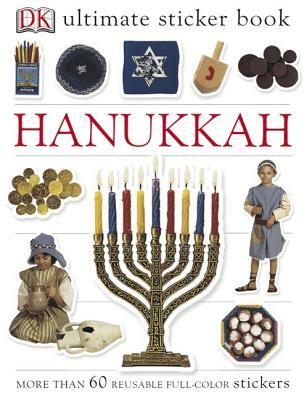 Learn about spinning dreidels and Hanukkah gelt (those delectable chocolate coins). Each Ultimate Sticker Book presents an array of colorful, photographic stickers of baby animals or dinosaurs, the US Presidents or the night sky–there's something for everyone. Young children will love working with these durable, reusable stickers, and they can have fun using the stickers to make picture books and projects on their own. These entertaining books provide a hands-on way to explore new subjects. (And some of the stickers even glow in the dark!) Includes over 60 full-color, self-adhesive stickers.